A short play set in World War Two – and written by Rev Canon David Banbury from Leyland in Lancashire – starts a week-long run at the Edinburgh Festival Fringe next week. Members of The Church of England in Lancashire and Lancashire Methodist Church District are set to follow in the footsteps of Peter Cook and Dudley Moore; Stephen Fry; Tom Stoppard; Derek Jacobi and whole host of other famous names who have performed at the Edinburgh Festival’s famous Fringe. A short play, Home Front/Front Line, written by Rev Canon David Banbury from Leyland, who is the Church of England Diocese’s Parish Mission Support Leader, is the reason for the week-long run this August in Scotland’s capital city beginning on Monday August 14. The Fringe appearance came about after a conversation between David and a friend of his who had seen the play and thought it was ideal for the Fringe. After some serious prayer, the decision was made to make the approach to the Fringe organisers. They agreed straightaway. Costs – including accommodation for the actors – are being met through the generosity of local churches in Edinburgh. David said: “I’m absolutely thrilled we have been able to take the play to the Edinburgh Festival Fringe. It’s amazing to think that a lad who failed English at school should end up writing a play that appears at such a famous event! 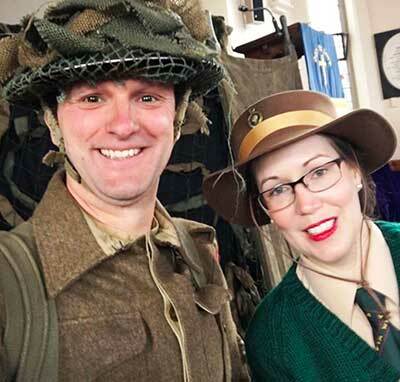 “We have already performed the play in a number of churches as part of 1940s weekends across Lancashire and Greater Manchester and people who see it find it to be a heart-warming and moving story, with a clear Christian message at the heart of it. Kirsty Gwyn-Thomas, from Buckshaw Village near Chorley, plays the part of Lizzie, and said: “Home Front/Front Line tells the extraordinary events of WW2 through the lives of two ordinary people. The story of Lizzie and Tom is based on diary entries, letters and official historical records from the Durham Light Infantry, and the stunning multi-media presentation seeks to celebrate love, commitment and faith in the face of separation, hardship and conflict. The play will be staged at the Lime Studio, Greenside@NicolsonSquare, 25 Nicolson Square, Edinburgh EH8 9BX, from August 14–19 at 6.30pm each evening. It lasts approximately 50 minutes. There is no charge for admission, but it is a ticketed performance and tickets are bookable in advance. Donations after the performance are encouraged but not compulsory! Cost of booking is 80p per ticket up to a maximum of £4.80 for 6 or more tickets. The box office telephone number is 0131 226 0026, or tickets can also be booked through www.edfringe.com. • David Banbury also wrote Brothers in Arms, a deeply moving play set during the First World War and produced by The Church of England in Lancashire and the Lancashire Methodist Church District. That play tells the remarkable story of identical twins Noel and Christopher Chavasse, sons of the then Bishop of Liverpool, who served together with great distinction on the Western Front in World War 1. It toured Lancashire in 2015 and 2016 and further dates are booked later this year.